There is a common misconception that the public cloud is set to take over the world of computing. It’s understandable why so many business and IT leaders think this. We’ve moved from the centralized, isolated server rooms of the 90’s to the decentralized, virtual world of today. Businesses large and small have realized massive cost savings through the public cloud. Small businesses are capable of harnessing enterprise-grade computing power on-demand. As the adoption of public cloud services has increased, many believed private cloud spending would fall. In truth, the opposite has occurred. Spending on private increased 28.2% year over year, reaching $4.6 billion in 2018. Private cloud is still important for many organizations. Because almost every organization now handles sensitive data, every organization should have its own private cloud. If you’d like to know what a private cloud can do for your business, you’ll find the answers below. 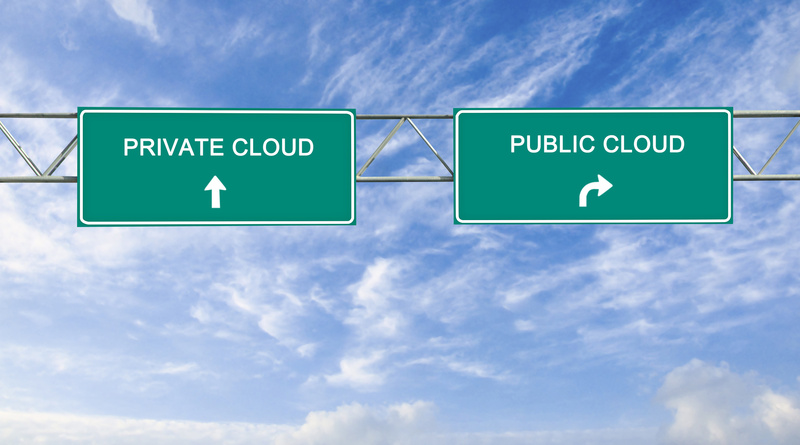 First, let’s look at the differences between public cloud and private cloud. Public cloud refers to computing services offered by a third-party provider over the internet. A simple example might be cloud storage applications like Google Drive and Dropbox. You can put a limited amount of data in cloud storage. You have access to it, but it isn’t “living” on a machine you own. You merely have access to it online. Email could also be considered a public cloud application, as could some forms IT outsourcing. More complex examples of public cloud relate to computing capacity and virtual machines. When an enterprise needs to add computing capacity, they tap into the public cloud infrastructure they’ve paid for. Public cloud is best used when companies or individuals don’t need the level of infrastructure and security offered by private cloud. Public cloud is both affordable and effective. By 2020, it’s estimated that 83% of all enterprise workloads will in the in the cloud. Of those, 41% will be on public cloud platforms, such as Amazon AWS and Microsoft Azure. 20% will be on private cloud and another 22% will be running on hybrid cloud platforms. But it’s the public nature of the public cloud that makes private cloud so attractive. In the public cloud, you are sharing resources with others. Every enterprise requisitions server resources using the same server. That means a spike in demand could leave you without enough resources to run your operations. For many businesses, the public option provides an opportunity to cut costs, but it’s less secure or reliable than using your own machines. Private clouds function almost exactly like the public cloud. The main difference is that the cloud’s resources are only accessible by a single organization. The IT infrastructure is private, not shared. Typically, a private cloud will reside on your company’s own intranet. There are a few ways to create a private cloud. You can use your own machines and your own staff, for example. In this environment, you can build, customize, and maintain your own infrastructure and hardware. If you don’t want to maintain your own data center, you can collocate your servers to a third-party data center. This helps you cut some of the costs of hardware maintenance, but you still maintain a private cloud. One of the easiest ways to create a private cloud is to have an IT managed services provider build one for you. Your provider can help you maintain and secure your private cloud. They’ll even provide Computer Support when you need it. One final option is to use a virtual private server (VPS). This is also called a virtual private cloud (VPC). In this case, you rent a private, virtual machine sold as a service by a hosting company. Virtual private clouds are useful for scalability and flexibility. However, this is not as secure as a true private cloud. You’re still a tenant on someone else’s infrastructure. You have superuser-level access and can define your environment as you see fit, but you do not own the hardware. Research firms predict that more than 146 billion records will fall victim to data breaches by 2023. Business cybersecurity is essential for organizations that wish to grow and maintain the trust of their customers. There is a long-standing debate about whether private is safer than public. The short answer is that private is safer, but it also depends on other factors. One thing is for certain: Any cloud environment is more secure than a legacy IT system. Deploying a private infrastructure, as a process, often requires many steps. When done correctly, private cloud environments are almost impenetrable, but humans make mistakes. In a public cloud environment, you surrender security responsibilities to your host, for the most part. There is some comfort in this. Chances are, your host has years of experience and a full staff protecting your assets. That also means you have no control over direct access to your data and the physical hardware it lives on. In a private cloud, you have control over the infrastructure and the hardware. Only your staff has access to your servers. Private and public cloud environments are susceptible to two different types of risk. Your private cloud environment could get compromised internally, for example. Meanwhile, your public cloud environment could get compromised if someone attacks your host. Private is more secure from outside attacks, but you must still take security precautions to protect it. Create a culture of zero trust in your organization to keep your cloud secure. If your organization handles sensitive customer information, it will be safer in a private cloud. Government agencies, financial companies, and healthcare organizations all rely on private cloud environments to secure their data. The benefit is the opportunity to maintain control over data residency. For example, you if have your private cloud on-premise, only your staff will have access to it. Having more control over your cloud environment can make it easier for you to follow regulations. It will also help you maintain optimal uptime. Of course, creating your own private cloud is a challenge. You should still work with an IT service provider. They can help create encryption policies and security best practices. They’ll help you achieve a successful implementation and follow regulations. Ultimately, some workloads should never be moved to the public cloud. They’re safer when run in your own environment. With private, your organization controls every computing and storage resource. You don’t need to share with other tenants. You can tap into these resources as you need them. You’ll have the ability to configure and customize your private cloud. You can install your own operating system, your own software, and your own security. The biggest challenge with this model is determining how you will scale. At some point, your organization will need more resources. Unless you use a virtual private cloud, you can’t buy more resources from a provider. But with strategic planning, you can create a roadmap for your private cloud. Map out future investments and when you think they will become necessary. An IT managed services provider can help you with this process. If you need more capacity sooner, you can migrate some workloads to the public cloud. Then, you’ll have a hybrid model. Proper data communication depends on the reliability of the network. With a private environment, you have complete control over maintenance and downtime. Most public cloud providers pride themselves on their uptimes. You still have no control over when a server may go down for maintenance. The data center may be miles away, even in another country. If there is a disaster, you could lose access to your public cloud. In a private environment, your staff has access to your physical hardware. You can also move around your assets as you see fit. If one department needs more computing power, you won’t need to pay a premium for it. You’ll only need to divert some of your proprietary resources. Shopping for public cloud services is easy. Big names like Amazon, Microsoft, and Google dominate the landscape. Assembling a private cloud requires products from many different types of vendors. The market has matured a great deal, however. Most vendors sell products that are cloud-ready. Despite the task of building your private cloud, it should still be a priority. The most pressing reasons to choose private cloud are control and security. Many businesses use a hybrid model. Their most sensitive operations belong in the private cloud. Meanwhile, operations that need more flexibility run through the public cloud. The choice between public, private, and hybrid cloud is up to you. It makes sense for every business to have its own private cloud, in some capacity. Looking for more tech insights? Check out the Networking Section on Power Inception for more tips.